Can Christian faith be reconciled with an historical approach to Jesus and the Bible? How as a scholar and a historian do you reconcile studying the Bible in a rationalist way with your Christian faith? I suppose it's an important part of my theological commitment that I believe that Jesus was divine in some way, but that it was Jesus who was divine. It was a human being who was divine. And that the tradition of Christianity insists very strongly on the full humanity of Jesus. And so, if I'm to understand my faith as a Christian, it's important for me to understand who Jesus was as a human being. So I see the kind of rationalist historiography that I'm engaged in as an important way of reaffirming a traditional element of Christian belief, that is, that Jesus was a full human being. But isn't that kind of approach going to be criticized on the basis of what you're doing as effectively corrosive of other people's faiths, even if it's not of your own? I would see the the enterprise of critical theology, critical historical theology, as a way of deepening faith. And, certainly, it can be an intellectual tradition that's challenging. It's challenging, I think, to an inadequate faith, however. And someone who engages in the kind of enterprise that critical historical scholarship engages in can in fact, deepen and broaden their faith. It may be a different faith that emerges as a result of critical historical inquiry than it was before that inquiry began, but it's still Christian faith. Some people would say that in reading the New Testament or the gospels in this spirit, you're approaching them in completely the wrong spirit by trying to treat them as history when they were really written as books of faith. That it's the wrong approach to these texts. The theologian reading the texts of scripture is very much interested in what kind of faith claims are being made by those texts. I think to analyze them critically from a historical point of view is not to do a complete and thorough analysis of what the significance of those texts might be. One of the greatest historical critics of this century is a fellow named Rudolf Bultmann who wrote a two volume theology of the New Testament, where, on the basis of his own analysis of the historicity of the texts, [he] went on to analyze the kinds of faith claims that they made. That's certainly an important part of a theological appropriation of scripture that can be enriched by and founded on a much more secure foundation of a good historical inquiry. What's the value in a historical approach to the Bible? I think we're, in some ways, forced to engage in a historical critical study of scripture by the problems of scripture itself. That is, the discrepancies that we see in scripture that make it difficult for us to construct a simple and coherent historical narrative out of the data of the text, which after all, are faith statements and calls to belief in Christ. At the same time, I think we're encouraged to engage in this kind of historical critical study because it enriches our understanding of the world within which Jesus operated, within which scriptural figures in general operated and with which they were interacting. We can't, for instance, understand what it means to proclaim the kingdom or reign of God unless we understand it was that proclamation was made in the context of an imperial power that had certain implications for human existence. I think too, by a historical, critical understanding of scripture we can both enrich our own appropriation of the teachings of scripture and also sort through some problematic elements in scripture. And I think unless we adopt a historical critical attitude toward our Biblical tradition we may miss appropriate scripture. For instance, if we apply too readily or accept without some sort of critical perspective some of the controversial statements within the gospel tradition about the Jews, I think we're being unfaithful to our Biblical tradition. But in order to understand those we have to put them into some sort of historical context. So we're invited to engage in historical critical study by the problems of scripture itself, encouraged to do so by the payoff of such study for understanding and enriching our appropriation of scriptural material, and I think absolutely forced to do so by the problematic elements of scripture which can only be understood within the historical context. What effect does the exercise have on your faith? I think the exercise of historical criticism has been an important ally of my faith. It's enabled me to take both an appropriately critical and also appreciative stance toward the Biblical tradition.... The historical study of scripture in general and of the life of Jesus in particular has enriched my understanding of who Jesus was, and what his own program was, and has made me appreciate all the more what the symbols of that that proclamation that Jesus made can be. And it's intensified my devotion to the faith. How, as a historian or as a believer, do you reconcile history or belief ? And what do you do as a believer when you find historical inconsistency in the gospels? Well, I acknowledge that then, as now, part of commitment to Jesus has to do with making one's own reconstruction of him, and this takes a number of very interesting forms. For example, if you look at Christian art in China, paintings on silk of scenes from the Bible, all the people in those paintings look Chinese. Now, there's no real mystery there. I mean, it's a kind of theological adaptation and appropriation that's going on there; there are no people who look quite like that in the Middle East in the 1st century, or at least, not a lot of them. But, what's happening there is the people in [China], through an aesthetic medium, are identifying themselves with Jesus.... It's that kind of theological project that's always underway when one when one encounters, in some way or another, Jesus. I appreciate the gospel writers as theologians in this respect. I mean by this [a] kind of rough and ready definition of theologian. I also understand that the gospels were not fashioned... to answer all questions on every matter.... The kind of project that the gospel writers have undertaken, the theological commitments that inform that project, and the literature that's resulted from it, is not going to scratch where we itch, if we're looking for the kind of pronouncements and articulations that we find in systematic theology. How would you [respond to the charge that] this sort of narrowly historical approach is reductionist, that you're bringing a rational approach to what was never meant to be rational, and that what you're doing is effectively going to have a corrosive effect on faith and belief? Christianity in the gospels, in the creeds, in the canonical dogmas, has always made statements that are both historical and theological. 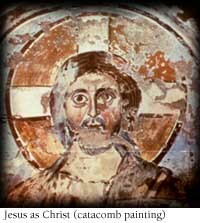 "Jesus is human" is the historical statement; "Jesus is divine" is a theological statement; we've made both of them and it would be absurd to go through the creed and say "son of God, that's theological; crucified under Pontius Pilate, that's historical," but when we come out into public discourse, it becomes crucial to know, when we're making a statement, whether it's an historical statement or a theological statement, because otherwise those who deny our theological statements; in other words, whose faith is different from ours, we say are denying facts; and people who deny facts have to be either hard in the heart or soft in the head. We might start to do something about such people. So, we have to be able to say, "This is a statement of faith; it's absolutely valid as such. This is a statement of fact, and therefore I have to be able to debate that in the public arena." Speaking personally, has your commitment to an historical approach or at least an attempt toward an historical understanding of Jesus, is that what lead you to leave the church? I left the church for two reasons which I cannot really disentangle anymore. The first reason was I wanted to get married. That was quite adequate right there all by itself, but I also knew that if the morning I was leaving, I was told we have a new law now, you can stay and be married, I would have left because I also wanted to get out so I could do the work I wanted to do without it being trapped in the negativity of others, trapped in opposing others. So, the two things were equally important, and I don't know exactly how they interplay. But was the effect of your historical research bringing you into full clash with the faith, with the church? Yes. I was working in Chicago under Cardinal Cody, and I was in constant trouble for what I said, and it was becoming more and more intolerable to sit with a Roman collar on and to say things that were....[controversial] people couldn't understand, "how can a priest say that?" I wanted to be able to talk -- I'm speaking as a scholar, and I'll take my cracks with any other scholar. I'm not speaking as a priest who would officially, maybe, be speaking for the church. So, it was a matter of dividing those two things. Do you see an irreconcilable conflict between work as an historian and being a believer? Do you still consider yourself a believer? I find absolutely no conflict between being an historian and being a believer, but you have to understand two things. I spent twenty years in a Roman Catholic religious order, which was a medieval order, and the medievals believed that reason and revelation were both gifts of the same God and couldn't contradict one another unless you had blown it. I don't think Thomas Aquinas got up every morning and worried about reading Aristotle, that he might find something pagan in there. He took it for granted, if Aristotle is reasonable, Aristotle will be right; reason comes from God. I approach it the same way. Anything I find historically, I cannot imagine how it could destroy faith, since faith is about the meaning of history not about the facts of history. So, I've never experienced a conflict myself. Whether there's a tension in my dual status as a critical scholar of the Bible on the one hand and as active ordained Lutheran minister on the other hand, that's a question that's always asked. I have never personally experienced a tension, at all. On the contrary, I always found it extremely helpful to be a learned Biblical scholar for whatever I did in preaching and teaching in the church. There's another aspect to that. One finds among conservative theologians often a fear that critical scholarship would be distracting. But this fear is much more expressed by church leaders than by active, involved lay people in the church. I've regularly given in our church, in our adult forum on Sunday morning , an instruction about the Gospel of Matthew and talked critically [about how] does the gospel come into existence? "No, Matthew was not the disciple Matthew who wrote it." And I don't find in our church anybody who says, "No, wait a moment, aren't you destroying our faith?" On the contrary, people are very interested. People want to be well instructed, learned, modern human beings in our churches.... They want to know. And I've been giving general retreats for clergy and I've done classes... and students who came to this class at first have to do critical interpretation of the Bible before they preach about the text. They come back and say, "Hey, this is great. We finally understand what this is all about." So I think that critical scholarship has a very positive service to the church. And I've always understood my own scholarship as a positive service that for the edification of Christian believers, [to] help them [develop] a better understanding of their faith in the world in which we live today. And what is interesting is the analogies between the problems that haunted the early Christians and the problems that haunt us today. I'm going to ask you to respond in a personal way. You are ordained and you are a scholar. Is there a contradiction between the work you do when you apply the lens of history to this subject matter and how you relate to it as somebody who has faith? I think everyone who has some sense of identification with the Christian tradition, everyone who has some personal engagement with the story and this community, has got to feel in his or her own life, a condensed version of the tensions which have been embodied in the whole of modern scholarship's attempt to understand the beginnings of Christianity, which for the last 250 years have caused nothing but trouble for the church. We have undertaken as historians to find out the real facts about how it got started and we've often-times done this because we really wanted to reform the church.... [T]his starts in the reformation, for example, with an attempt to get free of all the accumulated dogmas of the Roman Catholic Church so that we can restore true Christianity, as it was in Jesus' time and in Paul's time. Then along comes the Enlightenment, when we undertake to produce a really rational history so that we can find out what the real facts are, which may not just vindicate Protestantism against Catholicism, but will produce a truly humane religious... faith. And then we discover that ... our very notion of rationality is itself self-interested, that each of us brings the results of our histories and our own place of standing and so we find that, if we continue to ask questions, even the place where we thought to stand, in order to criticize the tradition, is undercut. It's undercut by new facts we discovered which are embarrassing to us, or discovery of the irrationality of our own rationality, as for example a feminist scholar says, "That's not my rationality" or a member of a minority group or from some developing country says, "yeah but you're presupposing white European society, in your rationality." So, that the very place where I stood to get my leverage on the tradition is undercut. I stand within this tradition. Everybody has to stand within some tradition. Everybody stands somewhere. And for me to say that I still regard myself as Christian is to say that self-consciously I choose to identify myself still with that tradition.... And as I see it, the fundamental task of religious people in our time is to discover the way that we can still be loyal to the tradition in which we were born, and which is meaningful to us and which we believe has conveyed truth to us, without closing us off to other kinds of truth, which come out of different traditions that through history have been in conflict with our own. And that is a task for the future. I must say if you look at the history of religious traditions, including especially the Christian tradition, you find wars, you find violence, you find bloodshed, you find intolerance, the inability to accept other versions of the truth. So this is very much a task for the future. It is something we do not know how to do. We have always felt "either I must defend my tradition as it is, and there can only be one truth and that's got to be our truth and therefore I can't listen to the others, or we have to look for the lowest common denominator," which enables us to embrace everybody with a kind of truth which is so wishy-washy that it doesn't have very much power for any of us. Surely we can do better than that, though I don't know how. But it seems to me that is precisely the task which is laid upon all religious people especially for the 21st century. It's a very small world which we have now entered into, and our very survival as human beings, perhaps, and certainly our survival as civil societies, depends on our ability to maintain loyalty and conviction without pretending to have certainty. Today there are many scholars who are looking for the historical Jesus. Not a new endeavor, but certainly with a great new impetus provided by these new sources. There are those who say, with John Dominic Crossan, that Jesus was a peasant Jewish sage of some kind, and there are others who say, with another group of scholars, that Jesus was, on the contrary, an apocalyptic teacher of the coming end of time. Both groups claimthat they can get to the real Jesus. And that if you read the sources right, you make the right selection of the sayings and the materials, you will find the real Jesus. I have doubts about that. It seems to me that history doesn't get you there. It would be fascinating if it did. If we had videotapes, if we had transcripts. We don't have those. We have... a series of refractions of some extraordinary person, seen from a variety of quite different viewpoints. We have fragments, we have sayings, we have impressions, we have vignettes. That's what we have. And actually, as I read them, they're quite different, and they're quite contradictory. They may not be irreconcilable, but to me, it's not satisfactory to go back to one type of evidence and say, "this is the real Jesus," or," that's the real Jesus." What I see is that as far back as history will take us, we see an enormous range of different people. Now there's nothing really so dismaying about that. I mean, what if we saw the origins of the Christian movement as, in fact, a movement with strong disagreements, with powerfully different perspectives, people in conversation with one another struggling to understand what is the most important truth of their lives. Is that so different from the way we look for truth today? This might sound as though one were saying, "We'll never know who Jesus is." But that question is only because the perspective from which I spoke is a historian's perspective. I can't get back as a historian to Jesus. I don't think history will get you that far. Now that hasn't stopped Christians, all over the world, millions and millions of them, from having an intimate relationship with Jesus. Whether they're Russian Orthodox or whether they're Roman Catholics or whether they're Baptist or whether they're Quakers. So there is certainly access, religious access, in these sources to a spiritual presence of Christ, which is quite different from what would you say as a historian. Because there are many people today who base their lives on a relationship with Jesus as they perceive it. The fact that we don't have historical sources to get back to the so-called real Jesus has never stopped the movement from existing. It's very powerful, and that to me is totally fascinating. The sense that millions of people all over the world have found, in the figure of Jesus, a spiritual focus for their lives is absolutely extraordinary, it's fascinating. How does that happen, particularly when we don't have a guaranteed way to get you back there in some factual way?